CRITICALLY ACCLAIMED progressive rock band Fusion Orchestra have released their first album in 45 years following a surprise encounter with a fan in Japan. The band – which was active between 1969 and 1975 – featured vocalist and multi-instrumentalist Jill Saward, who has enjoyed a long and successful career in the music industry and has been the ‘front woman’ for jazz-funk band Shakatak since the 1980s. Stan Land, guitarist in the original Fusion Orchestra, has died age 67. Thanks to Dan Shooter, we have a little footage from the band’s set at the Dagenham Roundhouse Music Festival earlier this summer. 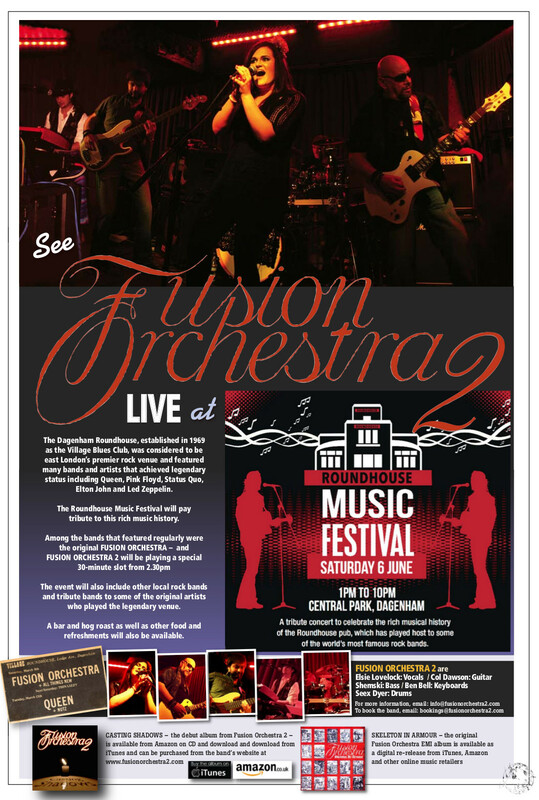 Fusion Orchestra 2 will be playing at 2:30pm on Sat 6th June at the Dagenham Roundhouse Music Festival, in Dagenham Roundhouse Music Festival, in Dagenham Central Park. The Dagenham Roundhouse, established in 1969 as the Village Blues Club, was considered to be east London’s premier rock venue and featured many bands and artists that achieved legendary status including Queen, Pink Floyd, Status Quo, Elton John and Led Zeppelin. 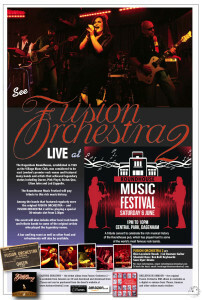 Among the bands that featured regularly were the original Fusion Orchestra who have been asked to play a set. The event will also include other local rock bands and tribute bands to some of the original artists who played the legendary venue. A bar and hog roast as well as other food and refreshments will also be available. On July 1st it will be one year since the release of Casting Shadows and we’ve decided to mark the occasion with a special release. We’ll be on Headbanger FM‘s “In Between – The Long Ones” show this Wednesday at 16:30 GMT being interviewed and having some tracks from Casting Shadows played. Tune in and listen! We’re pleased to announce that Casting Shadows is now available for digital download on CDBaby, Amazon and iTunes. Because of the way the main digital distribution channels work, the album is in a slightly different format with only five tracks rather than seven. The music is the same, but we’ve merged the Don’t Forget Your Key with Leaving It All Behind, and Secret Shadow with Unseen, Unheard and Unfinished to avoid both a glitch in the sound where there should be a smooth segue between the pieces and also to avoid casual browsers accidentally paying for either Don’t Forget Your Key or Unseen, Unheard, Unfinished as a “single”, as the distributors label any short track. Fusion Orchestra 2 are proud to announce that their new album, Casting Shadows, is now available to buy, priced at £10/€15/$20 including postage to UK, Europe or US respectively. Well it’s been a long time coming (and that’s putting it mildly) but we’re in the last stages of sorting out the new album. The current target date is the end of June, though we’re going to take out time to make sure we’re happy with the finished results and if that delays things a bit then so be it.